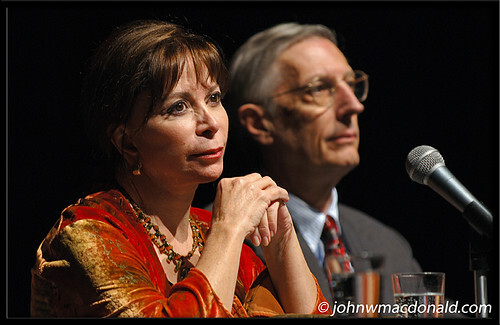 Isabel Allende & José Ruano, originally uploaded by johnwmacdonald. In the National Gallery of Canada in Ottawa, where Allende was the guest of the Chilean Embassy in Canada, the writer read from her latest book “Ines of My Soul.” This story is inspired by a sixteenth century Spanish woman, Ines de Suarez, who flees her homeland for the New World where she begins a fiery love affair with Pedro de Valdivia, a Spanish conqueror. Audience members had a chance to meet Isabel Allende, who now resides in the United States, in the National Gallery of Canada. She was introduced by Professor José Ruano of the University of Ottawa this evening, 23 October 2007.